The Creation Agreement remained the main constituent document of the CIS until January 1993, when the CIS Charter (Russian: Устав, Ustav) was adopted. The charter formalised the concept of membership: a member country is defined as a country that ratifies the CIS Charter (sec. 2, art. 7). Turkmenistan has not ratified the Charter and therefore is not formally a member of the CIS. Nevertheless, it has been consistently invited to participate and has consistently participated in the CIS, as if it were a member state. Turkmenistan changed its CIS standing to Associate Member as of 26 August 2005 in order to be consistent with its UN-recognised international neutrality status. Although Ukraine was one of the founding countries and ratified the Creation Agreement in December 1991, Ukraine chose not to ratify the CIS Charter as it disagrees with Russia being the only legal successor state to the Soviet Union. Thus it does not regard itself as a member of the CIS, and according to the aforementioned Charter of the CIS was indeed not a member, as it never ratified the aforementioned charter. Nevertheless, Ukraine kept being allowed to participate in the CIS, although not being formally a member. In 1994, Ukraine became an Associate Member of the CIS. On 14 March 2014, a bill was introduced to Ukraine's parliament to denounce their ratification of the 1991 Agreement Establishing the CIS, following the Russian military intervention in Ukraine and annexation of Crimea, but was never approved. Following the 2014 parliamentary election, a new bill to denounce the CIS agreement was introduced. In September 2015, the Ukrainian Ministry of Foreign Affairs confirmed Ukraine will continue taking part in the CIS "on a selective basis". Since that month, Ukraine has had no representatives in the CIS Executive Committee building. In April 2018, Ukrainian President Petro Poroshenko indicated that Ukraine would formally leave the CIS. On 19 May 2018, President Poroshenko signed a decree formally ending Ukraine's participation in CIS statutory bodies. However, as of 1 June the CIS secretariat had not received formal notice from Ukraine of its withdrawal from the CIS. As Ukraine was not formally a member, it did not need to withdraw formally, in any other way apart from ceasing to participate. However, Ukraine may still be technically a part of the CIS, as the Belavezha Accords, i.e. 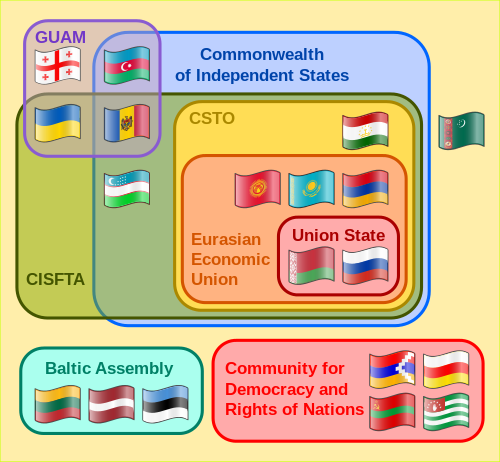 the Agreement on the formation of the CIS, as well as the Alma-Ata Protocol, and the relevant Alma-Ata Declarations, define that Ukraine together with all other former Soviet Union states, apart from the Baltic States (and Georgia that denounced these treaties), form the CIS. This series of treaties and declarations also define that the Soviet Union ceases to exist and the former Soviet Union states participating in these treaties take over the Soviet Union's legal obligations. To this end, the CIS secretariat (as well as the Russian envoy to the CIS) consider that Ukraine is still a state that that has not quit the CIS and may participate in it, while the Russian ministry of foreign affairs seems to take a more realistic stance and acknowledge that Ukraine has practically left the CIS. Ukraine had mostly ceased to participate in the CIS, from 2014, after being invaded by Russia, but on 19 May 2018, it passed a degree to officially stop participating at all. Nevertheless, the CIS secretariat stated that they will keep inviting Ukraine to participate, even though Ukraine is not a member and has officially and formally decided to stop participating. Ukraine has further stated that it intends to review its participation in all CIS agreements, and only continue in those that are in its interests. It was worth noting Ukraine was allowed to participate in the CIS, without even applying provisionally its Charter, which defines membership and other crucial issues regarding this organisation. Turkmenistan 26 December 1991 Not ratified "Founding state". Has not been a member, according to the Charter. "Associate member state" since 2005. Ukraine 10 December 1991 Not ratified 19 May 2018 "Founding State". Was not an official member, according to the Charter. Became an associate member of the CIS Economic Union in 1994. Withdrew from CIS as a result of the Annexation of Crimea by the Russian Federation and Russia's involvement in the War in Donbass As Ukraine was not a member, it did not need to withdraw formally, in any other way apart from ceasing to participate. Ukraine had mostly ceased to participate in CIS since 2014, after the pro-Russian unrest in the eastern part of the country, but on 19 May 2018, it passed a decree to officially stop participating at all. Ukraine may technically still be a part of CIS, according to the Agreement on the formation of CIS, its Protocol and the other relevant Alma-Ata declarations, but it has no obligation to it, as it is not a member of CIS. ^ a b "Poroshenko signs decree on final termination of Ukraine's participation in CIS statutory bodies". Retrieved 2018-05-19. ^ "Ukraine did not officially inform on its withdrawal from CIS, - CIS Executive Committee". 2018-06-01. Retrieved 2018-04-23. ^ a b c d e f "Ukraine's withdrawal from CIS to take one year - Vestnik Kavkaza". vestnikkavkaza.net. ^ "Ukraine's withdrawal from CIS to not bring it closer to EU, - Russia". 2018-05-22. Retrieved 2018-07-21. ^ "CIS to continue sending meeting invitations to Ukraine". 2018-05-23. Retrieved 2018-07-21. ^ "Ukraine to not denounce agreements on transit, employment within CIS". 2018-04-16. Retrieved 2018-07-21. ^ "Ukraine to reconsider all international agreements with CIS, - Poroshenko". 2018-05-21. Retrieved 2018-07-21. ^ "Proiectul hotărîrii cu privire la denunțarea Acordului de constituire a Comunității Statelor Independente". Parliament of the Republic of Moldova. 2018-01-02. Retrieved 2018-01-29. ^ "Moldova Says It Would Leave CIS Only After Becoming EU Candidate". Radio Free Europe/Radio Liberty. 2018-01-25. Retrieved 2018-01-29. ^ "FREE TRADE AGREEMENT BETWEEN AZERBAIJAN, ARMENIA, BELARUS, GEORGIA, MOLDOVA, KAZAKHSTAN, THE RUSSIAN FEDERATION, UKRAINE, UZBEKISTAN, TAJIKISTAN AND THE KYRGYZ REPUBLIC" (PDF). Retrieved 2018-07-21.